This is a unit of 36 hoplites serving in a mercenary unit of a Late Persian army against the Macedonians. 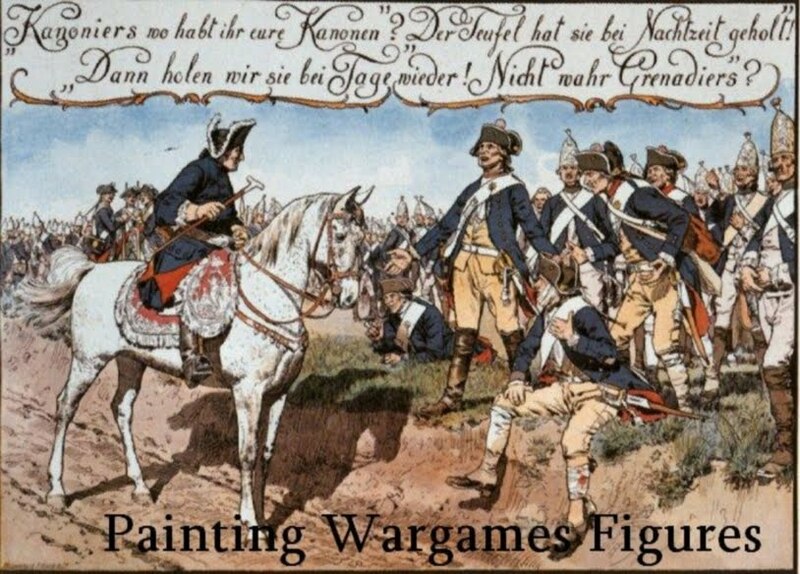 I'm not really an 'ancients' wargamer but its nice to stray occasionally out of my normal 18th century habitat. 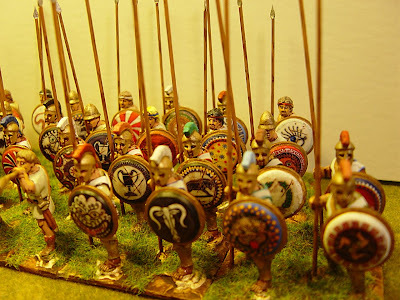 I plan to do both armies using WAB for an approximate points-count though for the battles themselves I will use Computer Strategies "Macedon & Rome". The corner-stone of the Persian forces will be this 40 figure (I need 4 more figures - happy to pay if anybody has 4 spare figures! 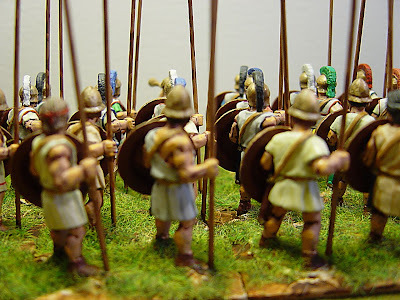 )unit of hoplites. 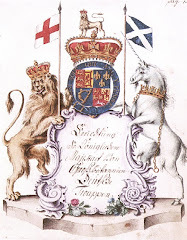 The rear ranks are unarmoured and just wear chitons in unbleached linen/wool (a great range of colours from Coat d'Arms paints)while the front two ranks have linothorax in greys and white tones. The shield transfers are by LBM and are a bit fiddly (try them in 15mm for really fiddly) but make all the difference. By the way, the figures are all fron Crusader's new Rank and File range and they are superb - even facial features beneath the helmets are easy to access with a paintbrush. Next week I should have received Eureka's WAS Dutch so they are scheduled for then. One week away from the 18th century has given me withdrawal symptoms. Savory update:Nothing to report as yet but I'm waiting for a price from the printers. 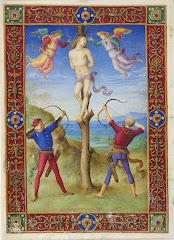 I don't think, sadly, there will be any chance of publication before Christmas of this year. Thank you to all who have sent me an email expressing interest and you should all have had a reply from me. Very nice figures, Nigel. Although I believe mercenary hoplites used plain bronze shield (oups!). 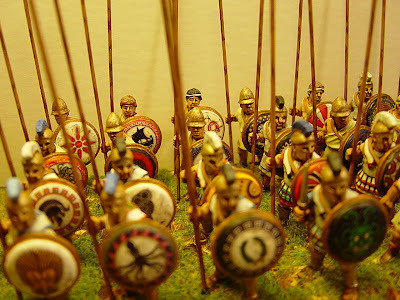 Well, you can always use them as macedonian pikemen. I don't care if mercenaries did use blank shields . 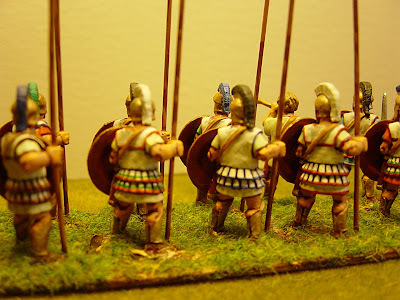 . . much of the fun of a hoplite unit is in its shields. Nigel, this unit looks wonderful.